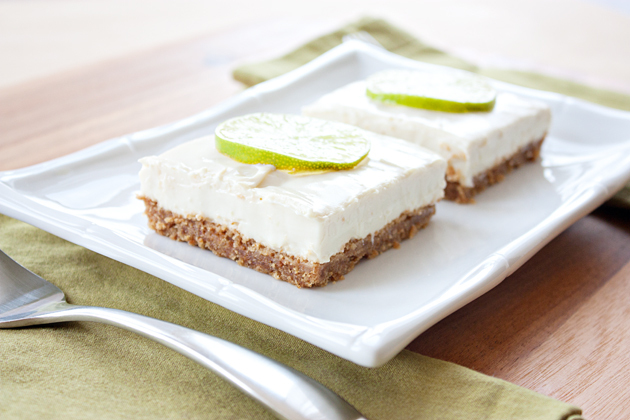 These tasty little lime bars are such a great hot weather treat. With minimal baking required (only a few minutes in the oven for the crust), you don’t need to be slaving over a hot kitchen in the middle of summer’s heat to whip up a batch of these insanely delicious treats! Plus, they’re super quick and very easy to put together. 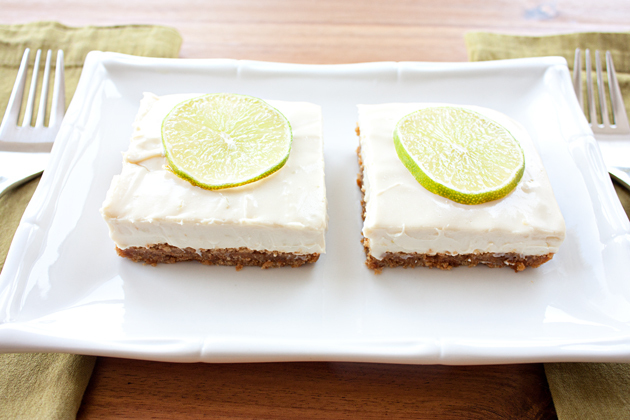 As for the taste—who can resist that delicious, creamy consistency coupled with the fresh and light flavor of lime? Not many, apparently, as I’ve served these bars at several potlucks now and the pan has never failed to come home empty. 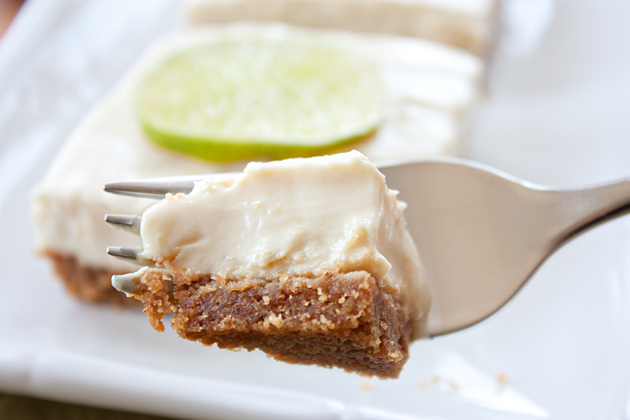 And the craziest thing about these cheesecake bars is that they consistently fool unsuspecting people who have no clue that they’re vegan. 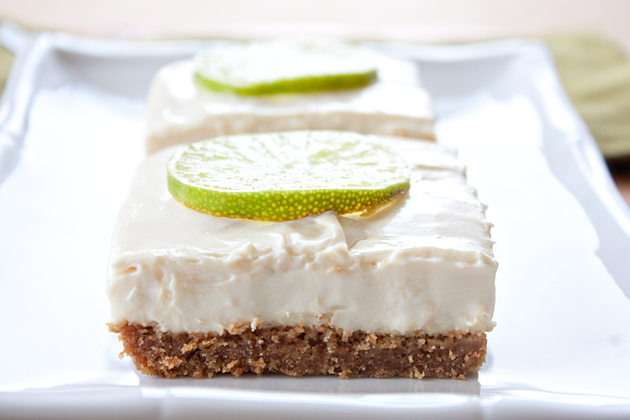 So here’s how you too can enjoy this creamy, delicious, lime bliss. You’ll first want to crush your 12 graham crackers. You can do this the easy way by putting them in a food processor and processing until crumbly, or you can do this the fun way by putting them in a Ziploc bag and crushing the hell out of them with a rolling pin. I chose the latter… mostly so that I didn’t have to wash and dry my food processor bowl to make topping. Lazy? Smart use of time? Yep, exactly. You then want to melt your Earth Balance in the microwave. It took me somewhere between 30 seconds and 1 minute on high to melt completely. You’ll then add the granulated sugar, graham cracker crumbs and stir to combine until everything is well incorporated. Pour the mixture into your 9×9 (or even an 8×8—you’d just end up with slightly thicker bars) pan and press it down firmly to form the crust. Place it in your preheated 350 degree oven and bake for 8 minutes. While the crust is baking, squeeze your limes and grate the zest. Set them both aside. 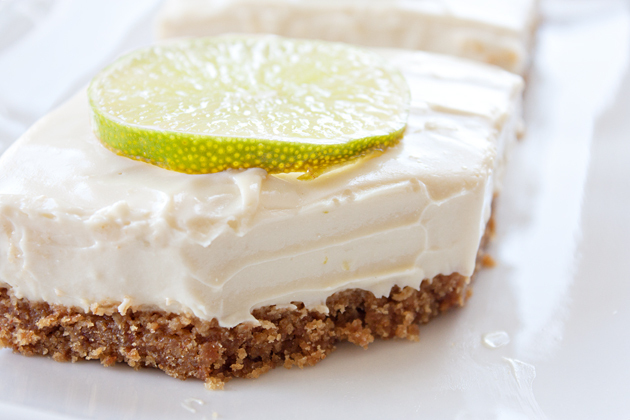 Add the pudding mixture to your food processor along with the block of tofu, lime juice, and lime zest. Add the agave (or other liquid sweetener) and puree. Finally, add the Tofutti cream cheese and puree until smooth again. Pour the creamy topping on the baked (and cooled) crust. Spread it evenly with a spatula and then shake it so that it’s flat and well distributed. Place it in the refrigerator and let it chill for 2-3 hours before serving. Lastly, cut it into bars or squares and enjoy! 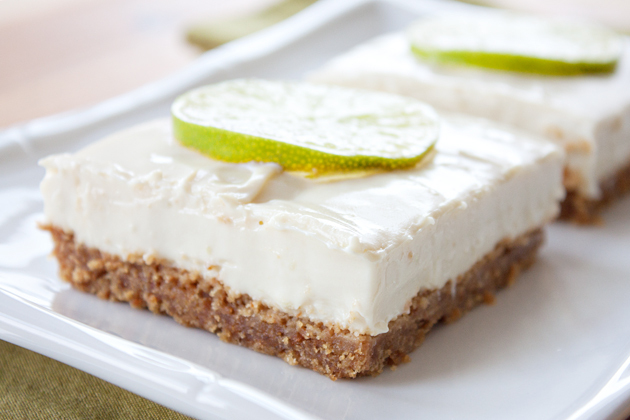 I added a slice of lime on top for decoration, but I could see adding lime zest as well, or sticking with no garnish as they’re just as pretty plain. 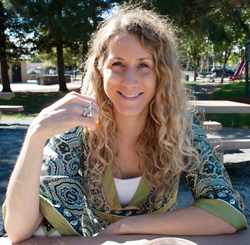 Crust: Combine graham cracker crumbs, melted butter, and sugar in a medium bowl. Pour the mixture in a 9×9 baking dish (if the pan isn’t non-stick, you may want to grease it first) and press down firmly to form a crust. Bake for 8 minutes and then set on a wire rack to cool. Filling: Blend the silken tofu, lime juice, lime zest, pudding mix packets, agave, and Tofutti cream cheese in a blender or food processor until smooth. Pour over cooled crust and chill in the refrigerator for 2-3 hours before cutting into squares and serving.